The Anacortes protests, near the Tesoro and Shell refineries, are part of a series of global actions calling on people to “break free” from dependence on oil, coal and other fossil fuels. Similar events are scheduled in Los Angeles, Albany, N.Y., and Washington, D.C., this weekend. 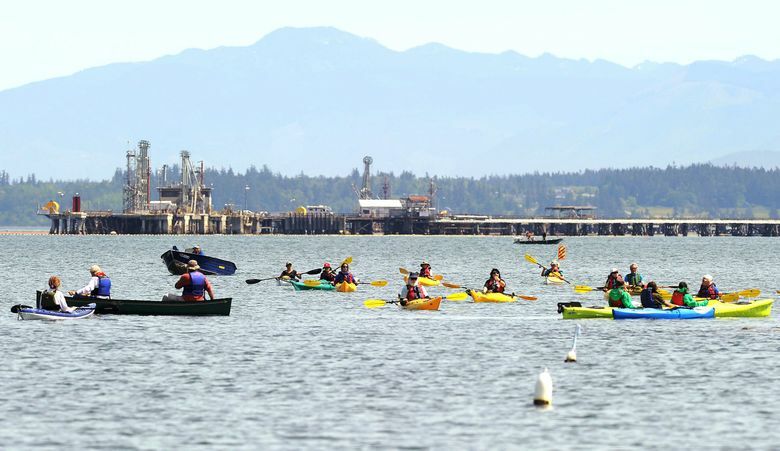 Hundreds of people in kayaks and on foot are gathering at the site of two oil refineries in Washington state to call for action on climate change and a fair transition away from fossil fuels. 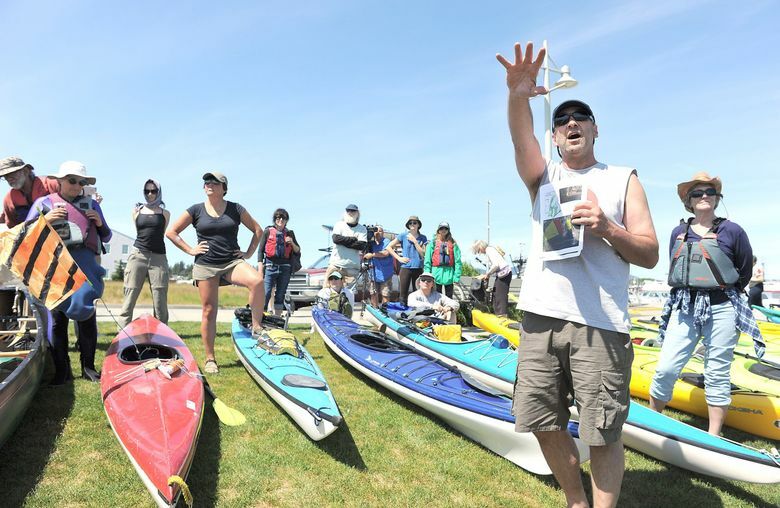 The three-day event that started Friday includes “kayaktivists” floating in kayaks, as well as community workshops, an indigenous ceremony and a three-mile march near Anacortes along the shores of Fidalgo Bay in front of the Tesoro and Shell refineries. Organizers say they want to transition to renewable energy in a way that doesn’t leave workers or communities behind, and they’re willing to risk arrest to engage in peaceful civil disobedience. The protests are part of a series of global actions calling on people to “break free” from dependence on oil, coal and other fossil fuels. Similar events are scheduled in Los Angeles and Albany, N.Y., on Saturday and in Washington, D.C., on Sunday. In Washington state, organizers are targeting two refineries that are among the top sources of greenhouse-gas emissions in the state. An environmental review is currently under way for a proposed oil-by-rail project at the Shell Puget Sound Refinery. Shell wants to build an unloading facility and a rail spur from existing tracks to handle about 60,000 barrels of crude oil a day delivered by train. On Friday evening, dozens of people were setting up a camp on railroad tracks near the refineries with the intent to stay and block the flow of oil as long as possible, according to a news release sent by event organizer Emily Johnston. “We’re putting our bodies in the gears of the fossil fuel economy to demand a just transition to the post-fossil fuel economy. World leaders agreed to limit global warming to 1.5 degrees — we demand that they do so,” said 63-year-old Annette Klapstein of a political organization called the Raging Grannies in the news release. Officials with both Shell and Tesoro said in statements that they respect the right of people to demonstrate peacefully, and that safety and security are their highest priority. Shell spokesman Ray Fisher added in a written statement that the company, which employs about 700 people at the refinery, is proud to be a part of the community and that the refinery is a vital part of the region’s energy infrastructure. Many of the nearly 40 groups involved in organizing the Break Free Pacific Northwest event were also involved in large kayaker protests against Shell’s Arctic oil-drilling rig when it parked at a Seattle port last year as it prepared to explore for oil in the Arctic. Afrin Sopariwala, 30, a Seattle activist with Women of Color Speak Out, plans to participate this weekend. “Looking at the conditions of the planet and my own family back home in India, and seeing how quickly and drastically the impacts of our decision are affecting the climate of the planet, I feel it’s my responsibility to future generations,” she said. The site of the protests, March Point, however, is situated between two ecologically sensitive bays. Padilla Bay, an estuary that has been designated for national protection and study, also hosts one of the region’s largest blue heron colonies, and some worried that protesters on land and in kayaks could interfere with the birds’ nesting season. The birds are currently foraging the bay to feed the chicks in their nests. Organizers say they are taking precautions to minimize the impact on herons, including keeping foot and vehicle traffic to the west side of March Point, telling participants to avoid sensitive areas, keeping boat traffic from certain areas and modifying when kayakers would be in the bay, to protect eelgrass and heron habitat. Ann Eissinger, a wildlife biologist who has studied the birds for years, said the timing was wrong but that organizers had done a stellar job of reaching out to police, media, participants and others to help minimize impact. “Our concern was on the ground, in the water and in the air. All three of those have been addressed,” she said.